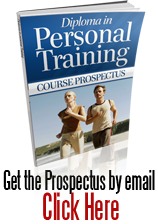 Where can the personal trainer course take me? A Diploma in Personal Training means you can set up as a freelancer and work at home or travel to your clients’ homes. You could also work freelance for companies who have a gym or want to improve the fitness of their employees. You’ll get paid for something you love! You could be working with business executives, busy mums, older people, in fact anyone who wants to improve their fitness level. This is a dream job for those who love health and fitness. Not only will you bring health benefits to your clients, but you’ll get fit at the same time as you’re training them. Personal training is no longer a luxury for the rich. As society becomes more health conscious, and people lead busy and stressful lives they employ personal trainers to help them achieve their fitness goals. Your Diploma in Personal Training will show you how to advise clients on a personal fitness programme that suits them, and how to motivate them to continue with their training. You’ll be able to show them how to keep up with the programme you set for them and achieve a fit and healthy lifestyle.